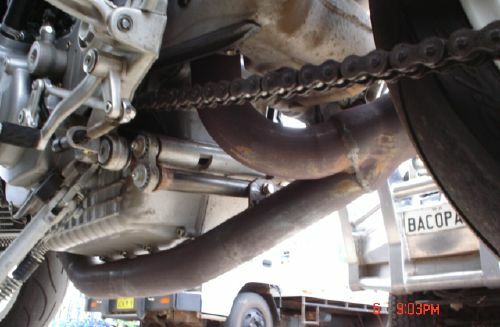 Summary: a report being text and photos from Dave, a WA owner of a S4R fitted with a home made 2  1 exhaust system. Including quarter mile times for various stages of modification and some dyno runs. A big thank you to Dave for both getting hands on and letting me share his work. G’day Brad. 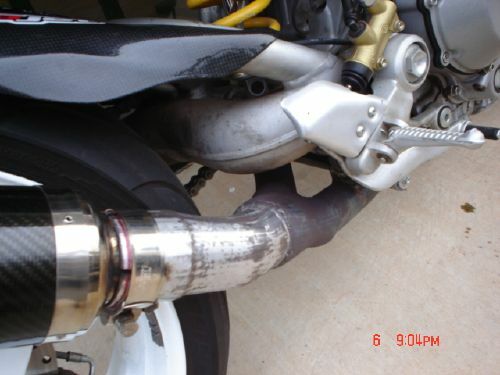 I thought I’d drop you a line and a few pics of the 2 - 1 exhaust I built for my S4R, and some info on how it went. As you can see by the pics, it’s a bit ugly at the moment, but I wanted to make sure it worked before spending dollars on ceramic coating. That’s going to happen now though, because it works a treat! I’m not sure if the system works any better than say a full-race Arrow or something similar, but it does make a huge difference over the factory Termi/air filter/ECU combo. I still haven’t got the dyno sheets I promised, coz the dyno is 450 km away, but I do have comparative quarter mile times for a few different combos. With the quarter time slips, the MPH is an indication of the power through the upper ranges, while the elapsed time is more a guide to whether I’ve popped another big wheelie off the line and scared the crap out of myself again! Anyway: to start. The standard bike with 1300km on it did 11.45 @ 121 MPH down the quarter. Very quiet as you know (too quiet I reckon), and not bad speed for a twin really. Next up was the factory Termi muffler (2 on the side), air filter and ECU package. For some reason when I was running the ECU the bike suffered a bit from excessive fuel consumption, dropping from 20 km/L on the highway to about 18 km/L, and was fouling the plugs at the drags (lots of idling involved), so I ran it with the standard ECU. It wasn’t too lean and pulled fine, but could have done with a bit more fuel at the top definitely. In that spec it averaged 11.15 @ 124 mph, a good power improvement. I also tried a 14 tooth front sprocket, but it was far more willing to lift the front, even with the front-end tie strap. With the standard 15tooth sprocket it was much harder to get in the air, but it also was much harder to roll off slightly to drop it down without losing a heap of time. The 14 tooth was easier to modulate the front tyre, but came up easier, so the overall time was about the same. 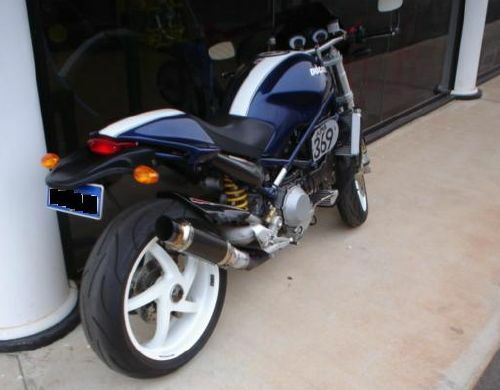 After talking to Wayne Patterson from Bunbury Ducati we did a deal. He needed a Termi pipe set-up for his demo S4R, and I needed a tuned up Power Commander for the 2 - 1 race pipes I was building, so we did a swap. Rather than go back to the standard mufflers, which were way too quiet to hear at the drags, I put on the standard 40mm twin pipes from the Cat box. Then used two 40 mm open slash-cut bits of exhaust tubing (to deflect gases from the rear plastics) jammed on the end without any mufflers at all. I was pleasantly surprised by the noise, not too loud at all, and the times went up a bit too, to average out at 11.15 @ 125 MPH. This could have been due to less restriction at the top compared to the Termis, or possibly because the standard ECU fuelling maps were closer to feeding the open slash-cuts better than the bigger Termis. Still, if anyone with an S4R wants a bit more thunder, but without being obnoxious, these simple bits of pipe sound great and are a heap cheaper than any muffler on the market. A bit of Cadmium-coat for the gold colour, and a bit of polish and they would do the trick really cheaply. Finally I got to run with the pipes I’d made in the shed. Wayne gave me an old rusty set that Ben Henry (formally of Vee-Two fame) had knocked up, made from 48 mm pipe with smooth 2 - 1 pipes off the head, looking a lot like the full Arrow system. Before they went into the collector, I cut the pipes off, shortened them by about 3” on each side to get the collector as close to the valves as possible (to try and move the mid-range collector-induced dip as low in the rev-range as possible), then joined the two into a collector with a 63 mm outlet. 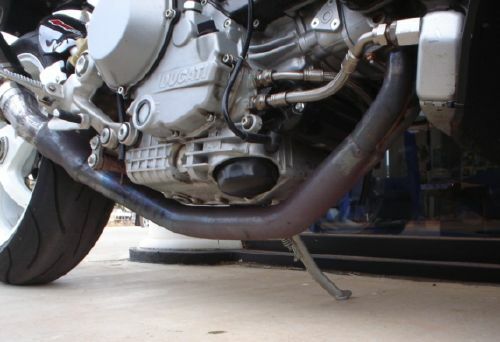 From that I then used 63 mm pipe, but press-bent around the back tyre (to reduce the diameter further down to 57 mm, and thereby get a double-scavenge), then flared the pipe out to 65 mm to jam a cheap muffler ($95 from ebay) into it. Cheap and cheerful, and as I said ugly, but I wanted to test the results without spending too much. If it didn’t work, I always knew I could plonk down for the Arrow system, and the job would be done. Anyway, the results were fantastic. Without any map in the Power Commander - just the standard ECU, it rattled off 11.05 @ 130 MPH averages with the same 60ft times as before. The extra tenth being due to mid-range grunt, and the extra 5 MPH due to the exhaust. That’s a big chunk of top-end power just for an exhaust change, and still not fuelled in properly. The last thing I did was to download a map into the Power Commander, using the “S4R with full Arrow race system” map. On the 300 km ride down to the track, it sounded absolutely awesome, got 21 km/L, and lifted the tyre in second from 4000 RPM just with an easy roll-in  at 6000 RPM she was way-up. Over two drag race meets it now averages 10.95 @ 134 MPH! A tenth is due to the mid-range fuelling, but yet again another 4 MPH and it still hasn’t been tuned on a dyno yet. In comparison, Wayne’s full-house 996 built by Vee-Two also does the same MPH with cams, head-work and an Arrow pipe, so the exhaust is obviously working. It is still a bit lean, as evidenced by the fact that having the baffle in is 1MPH better than taking it out - indicating a slight lean-ness in the top, but not dangerously so. So there you have it. A home-made thunder generator guaranteed to bring a stupid grin to any Ducatisti within earshot. Which reminds me - without the baffle in, it is seriously anti-social. 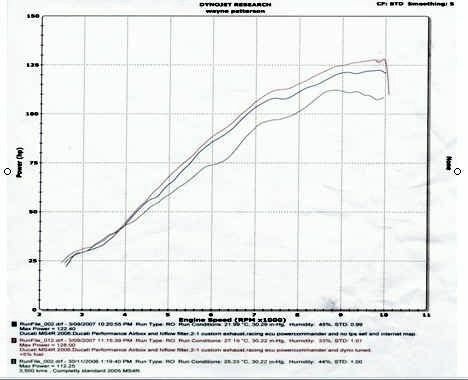 A few months later Dave sent me some dyno charts. They’re a bit small, but the curves are: Green  std S4R (not this bike, but on this dyno), Blue  Dave’s 2-1 exhaust and a PC3 with internet map, Red - Dave’s 2-1 exhaust and a PC3 with custom mapping. As you can imagine, he is very happy with his work, and rather relieved that it was worth the time and effort. It’s a very satisfying feeling when it works like this, and it’s great to see an owner take on the project. 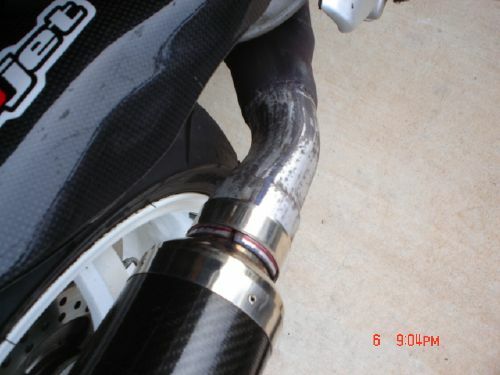 At this point, with anecdotal and dyno experience, Dave is most likely the world’s foremost expert on S4R 2-1 exhausts. Because rather than talk about it, he did it and has the results. Dave intends to get the cam timing checked and set at some point in the future, and my comments to him on that relate to the shape of the power curve. You can see that it hits the rev limiter with the power curve still climbing. As raising the rev limiter isn’t an option without changing ECU, I’d be advancing the inlet cams until the power peaked around 9,000 or so RPM. 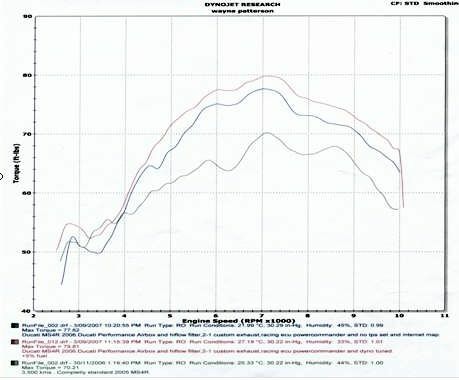 The S4R I dynod that had been fitted with the DP cams and exhaust kit made its max power at 8,700 RPM and went flat from there to 10,000 RPM, similar to most other 996 models with 45mm or bigger exhaust. We’d expect advancing the inlet cams to fill out the midrange some more too, so it should make more peak torque and better use of the available RPM range. Like many owners, Dave isn’t in the position to experiment too much with cam timing, but timing in the 113/110 range that we use on the short inlet cam 996 motors would be a good starting point, and with the exhaust obviously working well at the top end he may be able to advance the inlet cams further. Similar to the theory used in the “916 with SPS Cams” report, when you have a rev limit or desired power peak RPM, there’s no point trying to make power over that RPM, and advancing the inlet cams is a very effective way to both lower the peak power RPM and increase midrange power. I like to see the power go flat or start to fall away after the peak power RPM, as I know then that I’ve reached the best compromise with inlet cam advance. Some would use the word ‘optimum’, but ‘best compromise’ has far lower delusions of expertise.